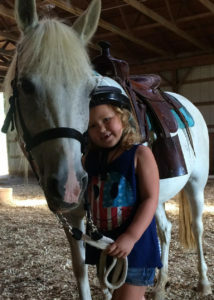 So, are you the horse crazy one, or is it one of your kids? Either way, this BLOG and the support materials that accompany it, will give you the most well-rounded introduction horses, horseback riding, and horsemanship. I can say this because I am not going to offer you just my own opinion. I am also going to link and refer you to other sources; and encourage you to seek out even more on your own. I was born the middle of a six-child family in a subdivision where I spent my elementary school years wearing cowboy suits, running around the yard on my hands and knees, and lapping Cheerios out of a bowl because they were made of oats. The high point was when a couple of teenagers brought their horse and pony down our block and sold rides - three houses down and back for a nickel. 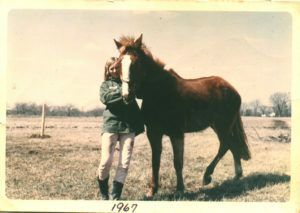 1967 - My first horse, King. When I was sixteen, we moved to a ten-acre farm house, and I up-scaled my bike for my first horse. I will tell you more about that purchase somewhere in a BLOG post or in my teaching materials. Aside from those hand-led pony rides, my total equestrian experience amounted to three trips to public riding stables on my twelfth, thirteenth, and fourteenth birthdays. The local elevator where we bought our horse feed sponsored a 4-H group. 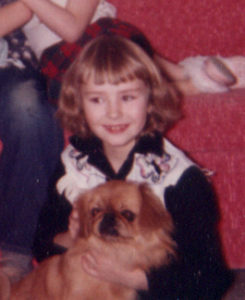 But, my parents worked nights and, with six kids vying for their time, getting to meetings was near impossible. The other members of the 4-H group had trucks, trailers, and parents who were involved in their hobby. In retrospect, there may have been a family there willing to add King and me to their parental obligations; but I guess we didn’t even know enough to ask. At any rate, as you can imagine, it was a pretty rocky start - ending with my up-scaling my horse for a car when I graduated high-school. 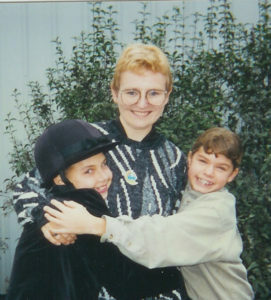 Newly married and in my early twenties, I enrolled in riding lessons. The stable’s trainer was nationally known and routinely sold his show horses for upwards of forty thousand dollars. He told me that horses are not as smart as dogs because they are prey animals. As is too often the case, because of his prestige, I blissfully believed him. My first piece of advice for you is to not necessarily believe what you hear in the horse industry - no matter who's saying it. Today, forty years later, we can find research on animal intelligence in the peer-reviewed scientific community. Maybe, we will learn that dogs are smarter - maybe, we won’t. Until then, I choose to believe that dogs were or are able to become smarter because (1) they live in our houses, and (2) they remain with one human for life. Dogs have the benefit of 24/7/365 to learn human-as-a-second-language, while our horses have a pittance of our time to learn human-as-a-foreign-language. And, the communication disconnect goes both ways. If our horses ate and slept with us day-in and day-out, we would be able to read what they are saying and asking as well as we can read our dogs. Over the forty years since, I have married twice, raised a son, and owned over thirty horses. 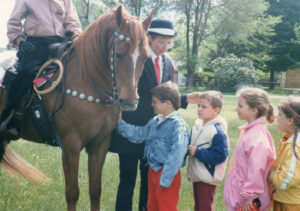 It was my original intention to own a riding school and coach students at horse shows. 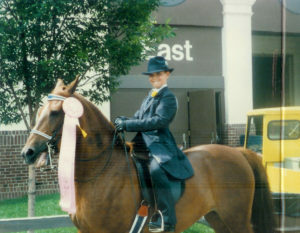 During the early years, when my son was young, I did coach a few of my riding students on the state Morgan Horse circuit until, at the age of eleven, my son said, “Why should I perform for some stranger who stands in the middle of the ring and tells me whether Stormy is the best horse; when I wouldn’t trade Storm for ALL of the other horses in the ring?” I can tell you that, as an adult with twin daughters, my son’s opinion has never changed. You won’t find him “performing” to impress others. He is a to-thine-own-self-be-true kind of guy, and I admire him all the more for it. 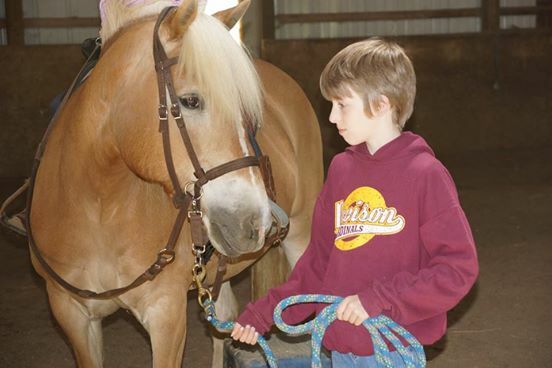 With my son off the show circuit and into trail riding and Little League, I set competition aside and, for the next thirty years, operated my riding school as a family-friendly, non-competitive stable that served non-horse-owning and new-horse-owning beginners - a market sorely ignored by our traditional horse industry. My own teenage experiences served me well as I introduced horse-crazy families who were as clueless as I once had been, to the hobby. After offering lessons to over a thousand students, I wrote an operating manual for stable owners who wanted to serve the novice market; and began producing teaching and support materials for them. This led to my garnering the All-Industry-Marketing award from a national horse industry association for the design of my business model. I will offer you access to these materials in various forms on this site. With Katie and Julie. These students must be near forty now! During all those years, I was pretty sure I understood horses. But, every so often, one of my horses, Stormy, would behave in a way that left me in awe. 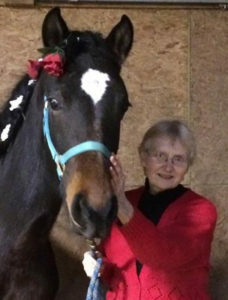 Storm and I shared a benefit that most horses and horse owners are denied, which is that she was born at my home, served as my son's show horse, my primary lesson horse, my personal trail horse and, in her late twenties, died at my home. She is buried behind my garage. As you grow into this hobby, you will be surprised to see how many people buy-and-sell horses willy-nilly as if they were motorcycles instead of live animals or members of their family. I even stated above that I’ve owned over thirty horses. At least I can tell you that, when I brought in a schooling horse only to learn he or she did not enjoy caring for multiple riders, I found them a forever home - usually with one of my customers who were ready to own their first horse. Two of my horses went to homes where I did not know the owners and I am ashamed to admit that here. Storm and I were essentially co-workers forty hours a week for twenty years. Close to a thousand people took their first-ever ride on her, in addition to over a thousand Girl Scouts. I considered her my colleague, but never pondered the level of consciousness that was at work behind those beautiful eyes - until she would do something that would stop me in my tracks, leaving me wondering, "Did she really say what I thought she just said? !” It is my sincere hope that you will have those moments with a horse you come to know well. When I retired my lesson program and the bustle of families no longer filled my yard, I was left with a very quiet barn inhabited by four schooling mares who had served me well. Two have since died of age-related illnesses. 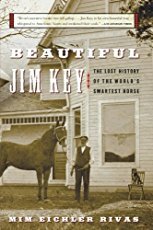 About that time, I read Mim Eichler Rivas' true story, "Beautiful Jim Key." I suspect you have never heard of it, so I suggest that you buy it now. It’s a documentary, not a kid’s book. Morgan Freeman was supposed to play the role of Jim Key's owner in a 2016 movie; but us horse owners are still waiting. At any rate, I so wish I had read this book when Storm was young. As close as we were, I rue the fact that she deserved so much more than the life I gave her. Never again would I look at my horses as if they were anything less whole than me. It's not like I didn't know there was a person inside a horse. Of course, I did. But, now I wondered how, for forty-five years, I could have been so ingrained in traditional horsemanship that I never wondered just how much person. I began to consciously interact with my two remaining horses, Sara and Sparky, as if they were truly as whole as me, and they became surprisingly more expressive. Two years ago, at the age of sixty-three, I adopted Zena, a pregnant Morgan mare. Her daughter, Ruby, is eighteen months old as I write. When she is thirty-five, I will be ninety-eight. I am trying my best, in spite of way too many deeply-ingrained knee-jerk habits, to raise her whole. A couple of years ago, I discovered just the edges of a world-wide horse conscious community. It is comprised of tens of thousands of loosely woven together owners who share the belief that horses are much more whole than previously thought; and that mutual trust goes so much farther than negative reinforcement. Their movement appears to be growing exponentially and I am so enjoying the friends I have made among them. I spend easily twenty hours a week just researching and comparing information from the various trainers and authors promoting horse consciousness. You can read about it in my BLOG posts and my lesson materials. As you grow into a life with horses - a wonderful life indeed - I will appreciate and respect any comments you want to send my way - about what you read here, what you hear and read elsewhere, and how and in what ways you are enjoying time spent with with horses. Today, Valentine's Day, 2017, with Ruby, my nineteen month old rescue filly. Disclosure - Some of the services recommended on this website provide compensation to ahorseinmyhouse.com. All recommendations are based foremost upon an honest belief that the product, service, or site will benefit my site visitors in some way. Read the full Compensation Disclosure for more details. Our lives are crazy. Let’s stay in touch.